The Economix Blog for the New York Times passed on new research from the Pew Foundation. 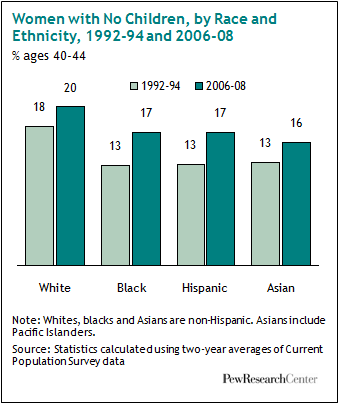 Pew finds that the number of childless women has increased in all ethnic groups. 20 percent of white women have no children. I suppose this isn't surprising; European women are even more likely to skip the minivan years. They are slightly ahead of us on this trend. The Economix was surprised that PhD/professional women are slightly more likely to have kids than women with a MA or BA. They are much more likely to have kids than a previous generation. Trail blazing with a kid in a Baby Bjorn isn't easy. The Economix ends with an interesting hypothesis and question. fields whose work schedules allow for a healthy work-family balance. making their career choices accordingly. Are there other explanations for why the country’s most educated women are more likely to have children today than they were in the 1990s? I don’t think the “Goldin Theory” holds water here. There are no vets or pediatricians with Masters Degrees, and the chart holds for them, too. My guess is bad chart-making by the New York Times. Looking at the census numbers, there are currently 8 Million women with Masters Degrees. In 1993, there 4 Million women with Masters Degrees. I think the current 8 Million includes the 4 Million women who “would have gotten a masters degree 18 years ago” who have a comparable rate of childlessness to the 1993 numbers and a completely separate group of women who “wouldn’t have gotten a masters degree 18 years ago” who are having children at a much higher rate, which is lowering the average. The numbers for PhD/Professional Degrees are similar (2 Million now, 1 Million in 1993). Those 1993 One Million are still there in the numbers, but the new million are skewing the averages. The college educated (and beyond) are all hanging out around 25%. Like Ragtime, I suspect the generations differ from each other. I suspect we’re seeing the effects of the increased pay offered to public school teachers who pursued advanced degrees. School systems increased pay for advanced degrees. If you can’t back those out, you’re not comparing apples to apples. There are many, many female teachers. Really good, Ragtime. Are you going to add your comment to the Economix blog? I tend not to comment in places where I’m not sure I’m going to check back in to see how my words have been taken out of context. Also — not a major factor in the calculations, I’m sure — but I’m also thinking about my mom, who was a woman with a Bachelor’s Degree and children when I was growing up. After I graduated from college (and her major childcare duties/expenses were done), she went back to school and got her PhD in her 50’s — meaning that she appears in two distinct columns of the “Child By Education” Chart — Bachelor’s with children in 1992, and PhD with children in 2008. But she never had the children (at home) and PhD at the same time. 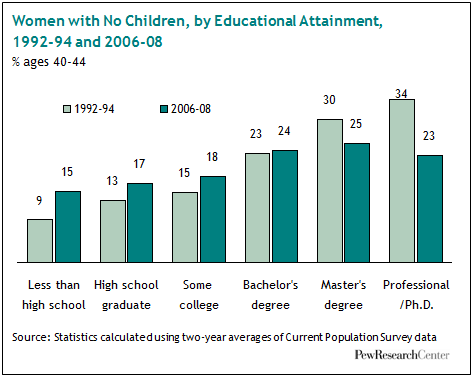 I’d also like to see a breakdown of the Ph.D./kids statistic based on whether the momPhD is employed or not. I agree that the theory that the Ph.D. pool has expanded, allowing those who wouldn’t have gotten Ph.D’s before to get them is a good one. I think this argues for Ph.D’s being more compatible with motherhood than they were for women who were 40 20 years ago (those folks were faced with an either/or choice). But, I’m pretty sure that it doesn’t show that Ph.D level work is more compatible with motherhood (though I’d exect some effect there, too). I’d also like to see a breakdown between Ph.D./JD/MD (which I presume are collapsed in those categories), with employed/not employed. I’m ignoring the masters, ’cause I do agree that many of those might be teachers/social workers/others who have always had children, but now are required to have a masters to pursue their work, and ’cause I don’t know much about the demographic of people with terminal masters. Interesting how education level can be compared to whether or not a woman has children. I agree, I find it surprising that women with a PhD are more likely to have children than those who hold a bachelor’s or master’s degree. I would have though it to be the other way around.